With the recent post on Pluto, one of the questions that came up was about imaging Pluto itself. Currently the best image we have of Pluto is one taken by the Hubble telescope. It is a blurry smudge of shading without any real detail. At the same time, Hubble has taken extremely detailed images of distant objects, such as the ultra deep field. So how is it that Hubble can image distant galaxies in detail, but can’t get a detailed image of Pluto? It all comes down to an object’s size. Not its actual size, but its apparent size. Pluto as seen from Earth is about 0.1 seconds of arc in apparent diameter. The Hubble eXtreme Deep Field, by comparison, is about 140 seconds of arc across. You can see a comparison in the image here. 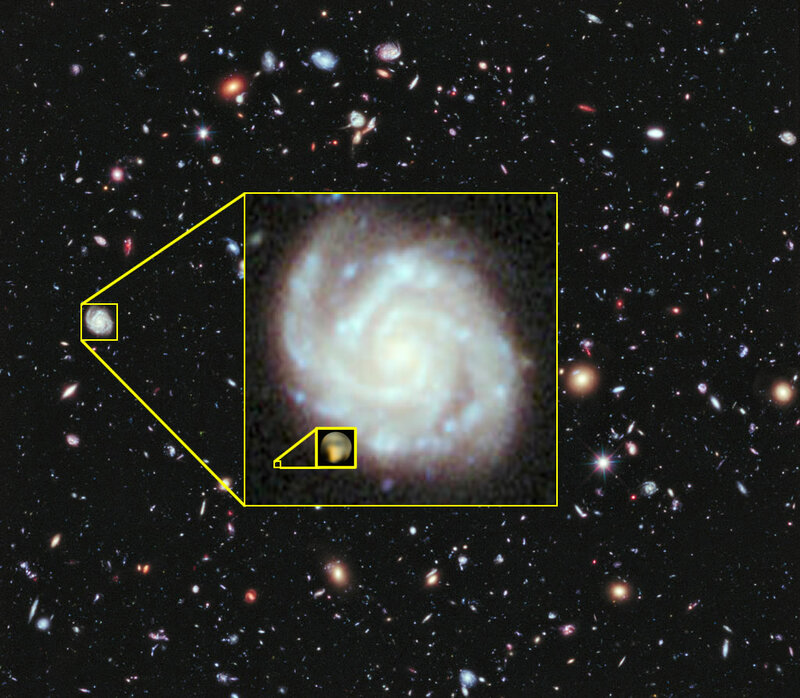 The main image is the eXtreme Deep Field, and in the center is an enlarged view of one galaxy within that field. On this enlarged scale, Pluto would occupy only about 4 pixels, so we need to zoom even more to see any detail. And that’s the point. Pluto is much closer than these galaxies, but Pluto is less than 2400 kilometers wide. The distant galaxies, on the other hand are hundreds of thousands of light years across. There are other factors that come into play, such as how bright an object is. The resolution we can get from Pluto is better than a similar sized area in the deep field. But the key point is that sometimes objects that are close are smaller in appearance than distant objects.